Jervis Bay and its surrounds offers a perfect cycling location offering multiple cycle tracks suitable for beginners to highly experienced riders. We guarantee you won't be disappointed. Around Jervis Bay Bike Hire and Tours is located in Huskisson, a suburb of Jervis Bay on the NSW South Coast. Bikes can be reserved in advance by phone or email and delivered directly to your holiday home or accommodation when required free of charge or pick up from our shop. 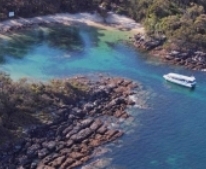 Discover Jervis Bay Luxury Sailing is available for private charter and offers a complete sailing, swimming, snorkelling and dolphin watch experience giving you the chance to immerse yourself in the beautiful nature of the Jervis Bay waters. Enjoy lunch at a deserted white sandy beach and swim in crystal clear waters. The Bottlenose dolphins live in Jervis Bay all year round and whale season is May to late November. 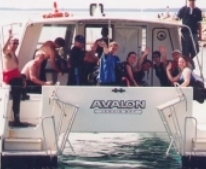 Dive Jervis Bay offers a variety of trips for scuba diving and snorkelling. Experience some of the thirty plus great dives of Jervis Bay Marine Park, natures ultimate playground. The Dive Jervis Bay team are trained to the highest standard and are qualified to look after either the novice or experienced diver's in-water needs. Jervis Bay is home to 80 - 120 resident Bottlenose Dolphins who live inside Jervis Bay all year round. The average sighting rate for dolphins is 99 per cent. Whale season is mid May to late November. TEKIN III is a 17 metre triple-deck catamaran. 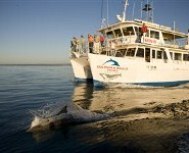 Dolphin and whale watch cruises include complimentary morning/afternoon tea. Jervis Bay has an abundance of bait and quality table fish, including snapper, sea bream, flathead and whiting, salmon and the fighting yellowtail kingfish. Jervis Bay is around 3 times the size of Sydney Harbour and its surrounding land mass projects some 16km further to sea than the rest of the coast line. The bay is constantly washed through by ocean currents and therefore it has earned a world renown reputation as one of the best land based game fishing spots for Marlin. 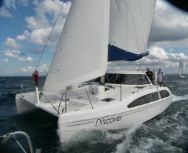 Offering private, skippered sailing charters on Jervis Bay since 2004. 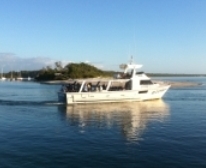 Highly experienced team to help provide a memorable experience of Jervis Bay.